If you’re using the FireDAC components that comes with Delphi XE5 Firemonkey and you want to save a bitmap or some other type of data to a blog field on your embedded database (either SQLite, IBlite, or Interbase To Go) it can be a bit tricky. For saving it is pretty standard fair with the TFDDataSet.LoadFromStream() which will load a stream like a memory stream into a field. The important piece to reading the blob back out is is the TFDDataSet.CreateBlobStream() function. I have included two functions below which show an example of how to read and write a string and bitmap data from an image using a FireDAC TFDQuery component. This method of reading and writing a blog works on Android and IOS as well as Windows and OSX. 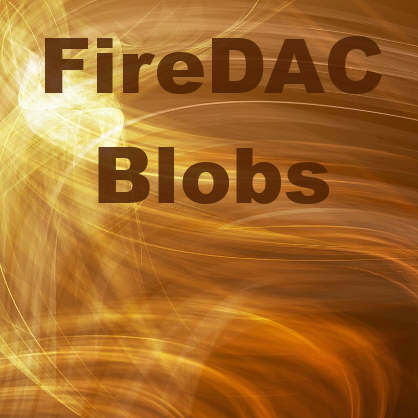 Head over and check out the FireDAC demo from Embarcadero and then use the functions to read and write your blob data. But what about using ParamByName.AsBlob (for single param) or AsBlobs[X] for multiple params in ie. ArrayDML? I cobbled this code together from different StackOverflow answers from probably previous versions of Firemonkey. and with that modify to use it with blob statements. But so far I haven’t had much success in using AsBlobs[X] with something that is binary(ie. jpg picture). Similar with LoadFromStream, where last parameter is also array index. Hope this can help others. Nice! I need to retrieve an image (blob field) stored on a mysql database, and put each image for each item on a ListBox, on Delphi XE6. When i run the executable, it shows an error message : “Loading bitmap failed”. Is it possible open blob (.pdf, .xls) in fmx android aplication? My restfull return blob from database!